10 day Japan's Golden route with Hiroshima including return international flights, accommodation, breakfast daily, professional tour guides, in-depth sightseeing and more. Cherry Blossom dates available! per person twin share |	Typically $5,060! 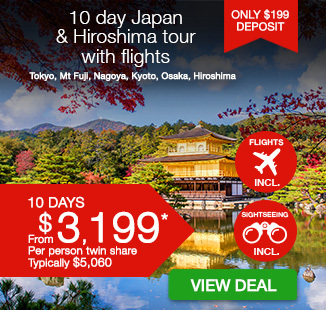 Experience the best that Japan has to offer with this 10 day Japan’s Golden Route & Hiroshima tour. See brilliant landmarks including Osaka Castle, Nara Park and the Kyoto Imperial Palace. Enjoy a spectacular view of Mt Fuji, ride on the bullet train, explore buzzing tokyo and be mesmerised by the Cherry Blossom season if you travel between March and April. Welcome to Japan! Upon arrival at Kansai Airport, you will be met and transferred to your accommodation. After breakfast we make the trip to the moving city of Hiroshima. Largely destroyed when the first atomic bomb was dropped over Hiroshima on August 6, 1945, the city became known worldwide for this unenviable distinction. Enroute, we stop in Himeji to visit the castle. The castle is regarded as the finest surviving example of prototypical Japanese castle architecture, comprising a network of 83 buildings with advanced defensive systems from the feudal period. It was registered in 1993 as one of the first UNESCO World Heritage Sites in the country. After, continue on to Hiroshima. On arrival the afternoon is free at leisure. Today we begin with the Peace Memorial Park and Atomic Bomb Museum, which commemorates the victims of the atomic bomb used in WWII. Later, we visit the Shukkeien Landscape Garden, which dates back to 1620. Being a short walk from Ground zero of the nuclear attack on Hiroshima, Shukkei-en suffered extensive damage, and then became a refuge for victims of the war. After renovations, it reopened in 1951. After we make our way back to Osaka where the afternoon is at leisure. After the Todaiji Temple we wander back through Nara Park, home to hundreds of freely roaming deer. Considered in Shinto to be messengers of the gods, Nara’s nearly 1200 deer have become a symbol of the city. We then continue to the city of Kyoto. We begin with the UNESCO World Heritage Kiyomizu-dera Temple and drink to your fortune from the streams of the Otowa Waterfall. The water is said to have a different benefit, namely to cause longevity, success at school and a fortunate love life. The Kiyomizu-dera Temple is one of the most celebrated temples of Japan and has spectacular views over Kyoto. Later, we board the technological marvel, the Shinkansen (Bullet) train from Kyoto to Nagoya. Travelling of speeds up to 280km/h it provides and incredible experience as the Japanese countryside zips by. On arrival into Nagoya you will be transferred to the hotel where the rest of the day is at leisure. This morning we make our way towards the Mount Fuji area to Lake Ashinoko. Lake Ashinoko was formed in the caldera of Mount Hakone after the volcano’s last eruption 3000 years ago. Today, the lake with Mount Fuji in the background is the symbol of Hakone. The lake’s shores are mostly undeveloped except for small towns in the east and north and a couple of lakeside. Later, we visit Gotemba Peace Park to capture a breathtaking view of Mount Fuji, Continue your tour with a visit to the Mount Fuji 5th Station, which at 2300 meters above sea level, the offers a commanding view of the Fuji Five Lakes area below. After we make our way to Tokyo where the rest of the day is at leisure. Today after breakfast we visit the Meiji Shrine, dedicated to the deified spirits of Emperor Meiji and his consort, Empress Shoken. Later, stroll through the Asakusa Kannon Temple one of Tokyo’s most colourful and popular temples before browsing for souvenirs at Nakamise Shopping Street. This afternoon, relax on a Sumida River cruise before arriving at Hama-Rikyu, a beautiful landscape garden in central Tokyo featuring seawater ponds which change level with the tides, and a teahouse on an island where visitors can rest and enjoy the scenery. Your last stop today is Shinjuku Municipal Observation Building for panoramic views of Tokyo before heading to your hotel. The rest of the evening is then free to get to know Tokyo at your own pace. Spend the day at your own leisure. At the appropriate time you will be transferred to the airport for your homeward flight. $1699 per person in addition to the twin share voucher.